This Movement is based in Louisiana in the Lafayette Diocese. 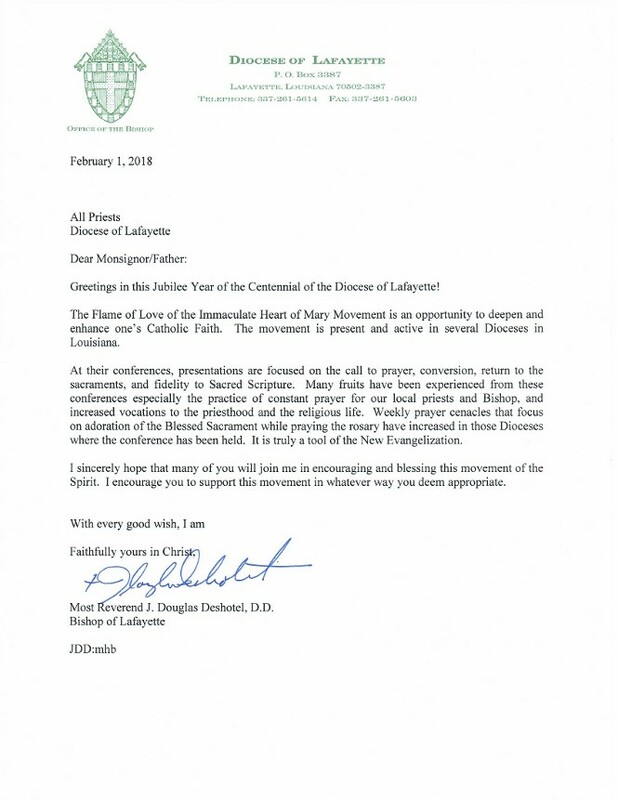 The propagation of the Flame of Love Movement of the Immaculate Heart of Mary Movement is currently spreading throughout the State of Louisiana. This Movement makes known and helps spread an "Extraordinary Grace" which God has given to mankind, in order to cause the outpouring of His Divine Mercy on all mankind, the Triumph of the Immaculate Heart of Mary and the New Pentecost. The Flame of Love Movement is a tool of the New Evangelization to help the laity further their commitment to their duty of holiness. The Movement now functions in many dioceses of the world, with the approval of the bishops and this spirituality has produced positive fruits. The Flame of Love Movement has revised tepid souls enabling them to embrace: daily Mass and Rosary, Eucharistic Adoration Holy Hours and Fasting, forming Prayer Cenacles of Reparation and becoming part of a community devoted to spreading the Flame of Love to others. The movement in the United States was approved by Archbishop Charles Chaput from the Archdiocese of Philadelphia, as he blessed the appointment of the National Coordinator in the United States, Mr. Anthony Mullen, who is a member of his archdiocese. The International Movement is under the aegis of Cardinal Peter Erdo of Budapest, Hungary, in whose archdiocese, the Movement originated. In 1996, the Vatican wrote to Cardinal Bernadino Ruiz, "I encourage you to continue so this Association bears fruits among its members." In 2009, under the guidance of Cardinal Peter Erdo, a theological commission was established to investigate and examine the messages given to Elizabeth Kindelmann by Our Lord and Our Lady. The church has recognized as authentic, in accord with the Catholic faith, all of the material contained in the Spiritual Diary, which received Imprimatur #494-4/2009 from Cardinal Erdo. Cardinal Erdo further states that the entire church receive this charisma, as a gift from God and that the effects of this Extraordinary Grace have already been poured out upon many countries in the world. On June 19, 2013, our Holy Father, Pope Francis, invoking the protection of the Immaculate Heart of Mary, imparted his Apostolic Blessing, which he extended to the Movement of the Flame of Love of the Immaculate Heart of Mary. 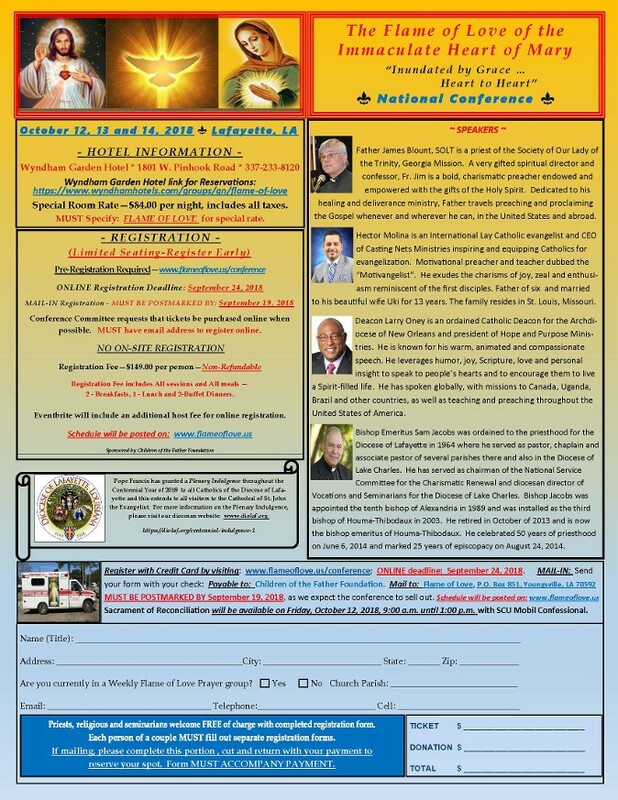 In September of 2015, the first Flame of Love conference in the State of Louisiana was held in Lafayette, La., which encouraged a second conference to be held on October 29, 2016, in the Diocese of Houma-Thibodaux. The conference was held at Christ the Redeemer Catholic Church in Thibodaux, La., with approximately 150 attendees. The presentations focused on the call to prayer, conversion, return to the Sacraments and fide lity to Sacred Scripture. Since the conference, our diocese has experienced many fruits from this Extraordinary Grace, especially the practice of constant prayer for our local priests and bishop, increased vocations to the priesthood and religious life, as well as those throughout the world. Weekly Prayer Cenacles focusing on Adoration of the Most Blessed Sacrament, while praying the Flame of Love Rosary and prayers, have increased in our diocese. Please consider joining our Holy Father, Pope Francis, Cardinal Peter Erdo of Budapest, Hungary, as well as many other in Bishops throughout the world, our own Archbishop Charles Chaput of the Archdiocese of Philadelphia and myself, in blessing this Movement in the Houma-Thibodaux Diocese to help guide the laity in propagating the Movement and the practice of the devotion of the Flame Of Love of the Immaculate Heart of Mary, for God's glory in His Church and according to His Will. I also encourage you to visit the website: www.flameoflove.us, to learn more of this Extraordinary Grace which Holy God has given to mankind. Many prayer warriors and groups in Louisiana have been propagating and practicing the devotion for quite a few years and the devotion is spreading rapidly, again, with beautiful fruits resulting from these prayers. Mr. Anthony Mullen, the National Coordinator in Philadelphia, PA, has appointed Ms. Michelle Guidry from the Diocese of Lafayette, LA, to be the Regional Coordinator for the State of Louisiana. Please consider contacting Ms. Guidry and supporting here as she has prayerfully fulfills this position to say ‘Yes’ to Our Lord and Our Lady, in this very important mission of saving souls. 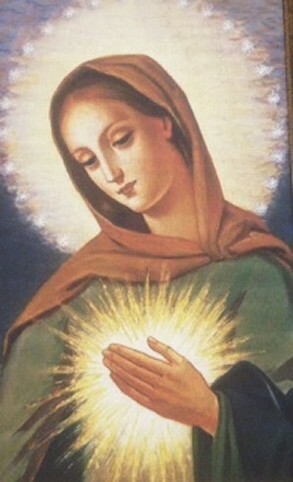 May our Lord and His beautiful mother, through the imploring force of the Holy Spirit, spread the effect of grace of the Flame of Love, over every soul in the Diocese of Houma-Thibodaux, Louisiana and the entire world. Flame of Love website by clicking here.